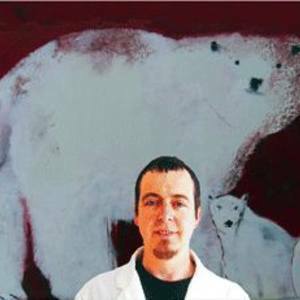 Northern Experience Series: Based on Andy's Yukon adventures in 2010. placed in Art Galleries in Victoria and Cowichan Bay. This series has symbols and patterns that tie in with environment and conditions in 'The North'. Driving snow, rain and storm-like conditions create a feeling of adversity but are part of the every day experience in Canada's north these pictures portray his interpretation of the extreme weather conditions not only in the north but elsewhere today. While painting these works this same feeling has been a part of his inner landscape and the Canadian landscape for generations. Andy came to the conclusion that animals, and other mammals face environmental obstacles and that the communication they expressed was what interested him. With more and more extreme weather events - humans are also facing these adverse conditions and so we have more than hunting in common, we have survival.